Last week it was a whopping 9 degrees out, with roads and fields covered in snow and ice: the kind of cold that chills you to the core at the very heart of winter. On a day that frigid, I was elated to join Meg and Roland for a photo adventure into a lush garden oasis at a local greenhouse! As soon as we entered, we were enveloped by warm tropical air, and a stunning jungle of exotic plants. Ah, bliss! 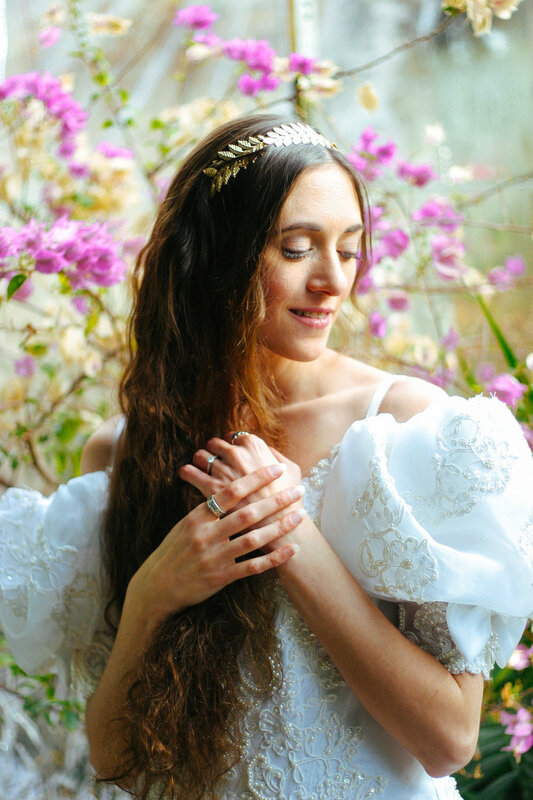 Meg's dress was a stunning choice for their faerietale garden romance photoshoot. It was originally a vintage dress that she acquired, creatively altered and made her own. The beading on the bodice was gorgeous and elaborately detailed, and the sleeves were fit for a queen! The golden leaf headpiece she wore perfectly completed the utterly romantic faerietale look. With a sweeping train, she looked like royalty on holiday - with her handsome love by her side for an exotic garden adventure. Gorgeous pink blooms, ferns and wildly growing ivy surrounded Meg and Roland as the explored the gardens. I could not get enough of this beautiful tunnel of flowers and greenery! I had to capture a few ethereal portrait shots of Meg enjoying the flowers. I love her playful spirit, and feel that these photos of her amongst the flowers showcase her vibrant personality! Candid shots perfectly capture the joy of a moment. Further on they ventured, exploring deeper into the hidden corners of the greenhouse. One of my favorite plants we discovered that day was some mysteriously otherworldly and gorgeous hanging moss. I have resolved to make myself a greenhouse someday, solely so I can have a hanging curtain of moss around all the time! Moss is utterly romantic, with stunning texture, and really adds a touch of mystery and beauty to these photos. We took countless pictures amongst that glorious curtain of moss. Here are a few of them! Roland absolutely rocked a mysterious and stoic expression for his portraits: perfectly fitting with the curtain of moss for the background! I adore this moody capture, for something reminiscent of Romanticism: more dramatic, with an extra air of mystery. ...and of course followed by some playful snaps of their adorable antics! I loved capturing the candid laughs and joy of these two! I am in love with these orange trees: I adore fruit/citrus elements incorporated in florals, and the sunny citrus inspiration via the cascade of oranges overhead was most welcome on such a cold winter day. You can feel the warmth in the photos! 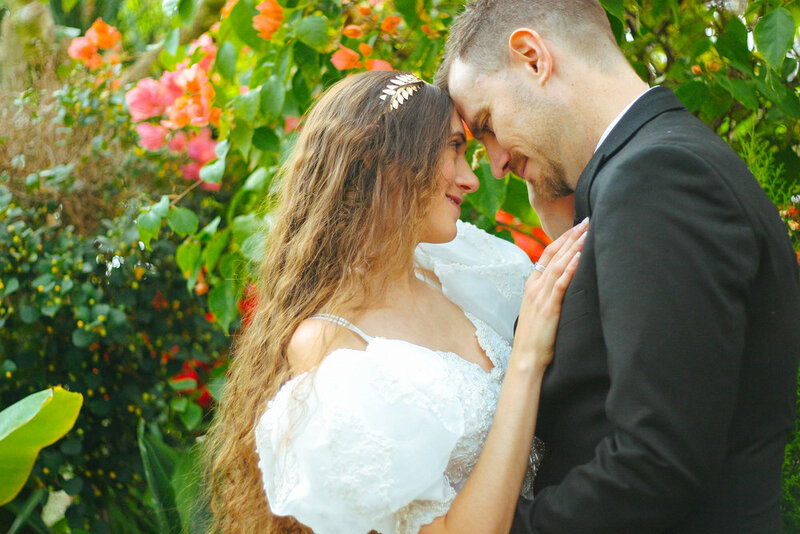 A gorgeous and tropical bush of coral flowers made for an equisite backdrop for more couple's shots. I am always hunting for what will beautifully frame the subject, and further enhance the feeling of the overall picture. I saw these soft magenta flowers and thought they would make for a stunning background for some ethereal and luminscent portraits of Meg! What a gorgeous ring! No shoot is complete without getting a picture of the ring. Thanks Meg and Roland for a wonderful afternoon of photo adventuring!